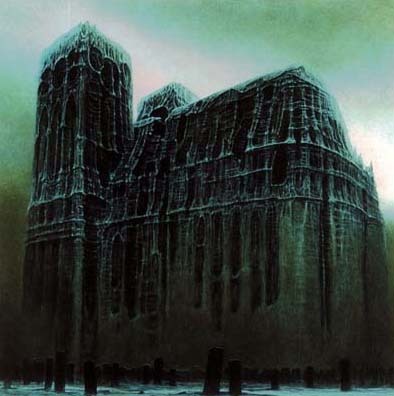 Zdzisław Beksiński has to be one of my favourite artists, I have been in love with his bone church collection for a very long time. While looking up some information on H.R. Giger I stumbled upon the Morpheus Gallery and discovered a hose of other similar artists. Beksinski stood out from all the rest immediately. I’m obsessed with christian iconography even though I’m very much a part of the heathen harvest! I love churches and cathedrals especially, they are such beautiful building it’s just usually a shame about the occupants. Back to the subject, being a goth and living for death, the bone church pictures pictorially describe everything that I love in one go. They are dark, there is a element of death and decay, they pictures famous churches, there are most often a lotta tombstones… what more could a goth chick want? The Platige animation team made a movie a few years ago, called Katedra which I believe is Polish for Cathedral, the short animation which was based on a book of the same name is available on their website http://www.platige.com I’m sure they were highly inspired by Beksinski’s work..